Quite honestly, whilst I like most of this months pins, I’m not blown away by any of them I’m afraid. Let’s take a closer look week by week. Saturday 2nd November sees the release of the 2014 pins, each year Disney Parks creates a new ‘look’ for the year, and whilst I really like 2014’s look, 2013 just had that bit extra. However, that doesn’t translate into pins, and I really feel like the 2014 pins are very nice to look at. I especially like the use of the Sorcerer Mickey image in the pins, and like the 2014 ‘Disneyland Paris’ pin, perhaps this is a collectible set across all the resorts? The booster set really catches my imagination, I really like the characters in front of various Disneyland Paris landmarks. I will certainly be adding that to my collection. Saturday 16th November sees the release of another good luck/bad luck pin, this time featuring Belle. I’d be interested to see the good luck side if the ‘bad luck’ side is Gaston. The Beast makes both perfect sense and no sense since Belle never wanted to be locked up. 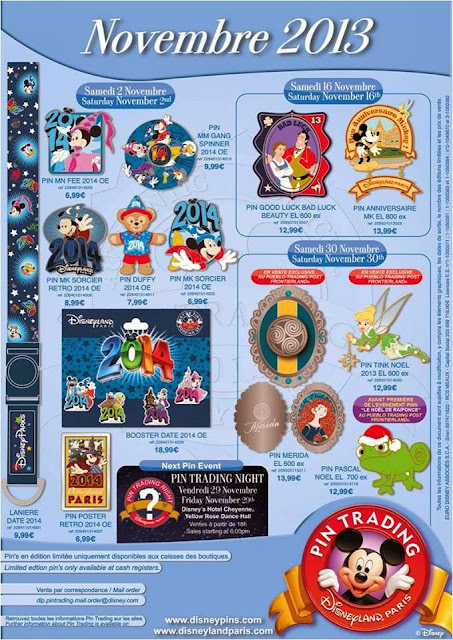 I really, really like the Mickey Mouse birthday pin and hope it is still available the weekend afterwards when I will be in the resort, however I suspect it will not be. It looks to be a lovely pin, perfect for the Disneyland Paris audience. The final weekend releases take place on Saturday 30th November and feature yet another Princess locket, this time featuring Merida from the film Brave. The final locket should be released next month (and will be Tinkerbell). 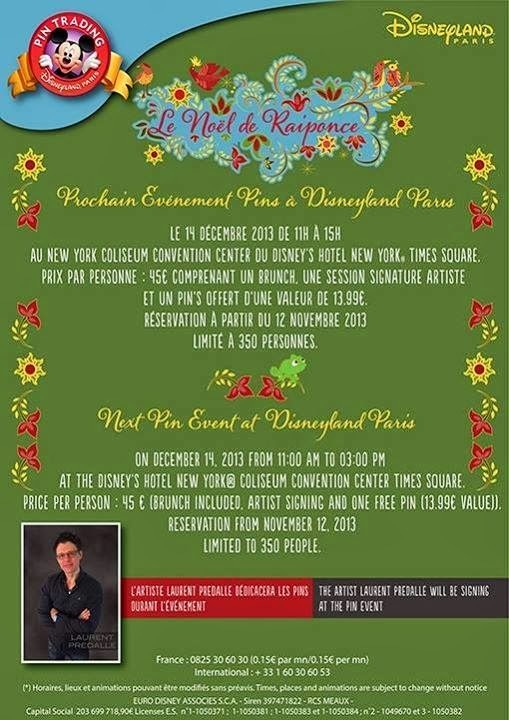 Speaking of Tinkerbell, the Christmas limited edition pin will be released this weekend as well. I find it a rather uninspiring pin for a limited edition, despite its nice design. The Pascal pin is a preview release for the ‘Rapunzel’s Christmas’ pin event which will take place in Disneyland Paris on the 14th December (poster below). Whilst this event will feature Rapunzel heavily, something bugs me about the price for what seems to be a very simple pin. However, an ebay search on release day will prove that it will be a very popular pin. (Rapunzel is VERY collectible in the Disney pin world). Overall, I’m happy with the pins, but only one jumps out as a must have. What are your thoughts?